Clear skin involves hydration, proper cleansing, and many other practices, but preventing the pimples we all despise also starts on your plate. That’s right, acne-fighting foods do exist. No, adding them to your regular diet won’t be like waving a magic wand over your every zit and watching them immediately disappear. 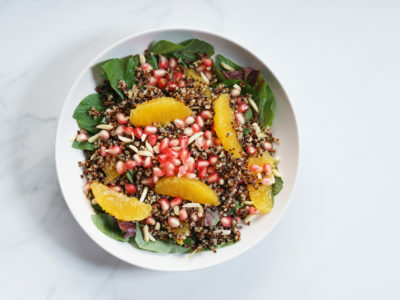 But these foods, listed below, contain compounds that contribute to banishing breakouts by addressing some of acne’s root causes, like inflammation and cell turnover. Eat them in place of inflammatory foods that are linked to breakouts, and you’ll be one exfoliation closer to a clear complexion (and will hopefully be able to use fewer chemical creams, too). Brazil nuts are loaded with the mineral selenium (which is also great for mood). Just one to two fulfills your need for the entire day—really. Selenium is important when it comes to skin health because it acts as an antioxidant, helping to decrease inflammation, which is known to cause acne. Eat these flavorful nuts as an on-the-go snack or chop them into pieces to top your oatmeal or Greek yogurt. Carrots contain healthy doses of both vitamin A and beta-carotene, which can reduce inflammation and encourage cell turnover (like a natural exfoliation). These acne-fighting foods also help strengthen your skin’s defenses against bacteria that can cause flare-ups. One study found an association between lower vitamin A levels and more severe acne. And it’s easy to work them into your diet: they’re the perfect crunchy snack to dip in hummus, or you can throw them in a soup or salad. Pepitas (a fun, fancy name for pumpkin seeds) are rich in phytonutrients and minerals like manganese, magnesium, copper, iron and zinc. Zinc, in particular, has strong antioxidant properties. It’s also been shown to reduce sebum, which can cause acne when too much is produced. Use the crunchy, nutritious treats to top a salad or bake them into healthy muffins to start your morning. Green tea is a great source of acne-fighting antioxidants —polyphenols like flavonoids and catechins—and it’s also great for hydration, which improves cell turnover, meaning you have more healthy new cells to boost your complexion. Dehydration can also cause swelling and puffy skin and a slowed response to acne medication or skin treatments. Brew a cup during the afternoon slump for both an energy and skin pick-me-up, or marinate your fish in it for a delicious, breakout-banishing dinner. Tomatoes are not only good for your immune system, they’re also amazing for skin thanks to nutrients like vitamin C and bioflavonoids that have powerful antioxidant properties. Start popping tomatoes instead of pimples by adding a few slices to a collard green wrap or making a chickpea and broccoli rabe salad, the perfect make-ahead lunch for the week.